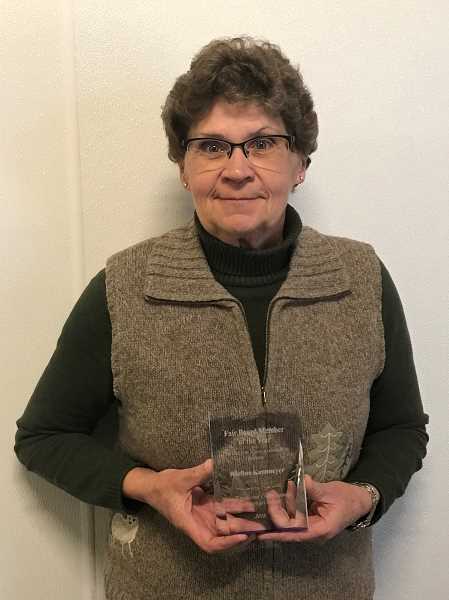 Clackamas County Fair Board member Raeline Kammeyer was recently honored by the Oregon Fairs Association as the Fair Board Member of the Year. Kammeyer, who received the award Jan. 12 at the Oregon Fairs Convention in Salem, has been a fair board member since 2008 and has built a reputation as a hardworking volunteer who devotes a large amount of her time and resources to the Clackamas County Fairgrounds and Event Center. She has a background in livestock and agriculture and served as an FFA adviser for many years. She even showed sheep at the Clackamas County Fair when she was an FFA student. As a member of the fair board Kammeyer is tasked with actively seeking out grants for financial assistance aimed at improvements to the fair facility.